Should fertility be considered a public good? Nowadays a huge debate is being discussed in Italy after the introduction of the “Fertility day”, promoted by the Health Minister Beatrice Lorenzin. This day was thought to stress public attention to the importance of fertility and to underline the danger of falling country birth rates. The reaction has been fierce, with many questioning if there may exist a better way to encourage people to have children. Actually what has caused such an anger is not just the idea of procreation as a matter for the government to intervene in, but the images associated with women’s role, considered as sexist and ageist. Despite moral criticism, it is important to see the question from an economic point of view. Are we sure that “fertility” should be considered as a public good? Economists are used to refer to public good as a non-rivalrous and non-excludable item. It is basically a product that one individual can consume or enjoy without limiting its availability to any other individual. Public goods are, by definition, provided by the mean of government in order to avoid free riding issues. In that sense “fertility” is not a public good because there is no direct intervention from a central authority. Neither the intervention seems to be needed as a way to repair a market failure. There is no market failure in having too few children. Most people may agree that having a child is a very personal decision based on own values, circumstances and life or career goals. Some people want to have children, some do not, some might only want them later: all choices are equally logic. One may say that people are free to set their own level of children, even if it is zero, and that government should not intervene in this kind of decision. It should NOT, but it is forced to. Because low birth rate is a primary concern to government and to society as a whole. As a matter of fact, many countries are experiencing the problems of an ageing population and have taken measures to try to influence their birth rates since these affect pension system and standard of living. If a country succeeds in setting an optimum level of population, then their people will have a better quality of life due to an increase in services, infrastructures, incomes. But there are still many implications on the public finance side. One of them is a redistribution issue: if maternity and housing benefits will be provided with taxation then people who are not keen on having a child (because they don’t want or they cannot) will subsidize the couples with a parenthood willingness. Another question would be: is it better to offer cash transfer in order to pay children stuff or to provide in kind services as healthcare and nursery? It’s clear that this phenomenon involves all of us, besides the weak economic framework that is triggering our society by a decade. Roughly speaking, the decision of having a child affects also the ones who do not. Many weird proposals had been already thought such as giving a flyer about how to flirt (South Korea), divulgate fairytales (Japan) or invite couples to take a holiday (Denmark) but in the meanwhile, population continues to age, affecting all welfare state and above all social security and pension system. Thus “fertility” may be not a public good, but rather a public concern. Categories: Ageing, Economics, Public Goods | Permalink. The Portuguese Health Insurance, accessible to everyone and truly beneficial? There are several types of health insurance systems being applied worldwide, and its differences are important to be known. Those can be found in the article below entitled “Health Systems Classification” by my colleague Jorge Moreira dos Santos. Portugal, as the same article describes, uses the so called National Health Service (NHS) which consists on a tax-based funding and public provision with relationships between agents being determined by the state. This basically means most people working discount to be able to ask for the health care treatment for free or at a reduced price, but then there are some others that privately contract it or benefit from some subsystems (some public, some private) depending on their professional work. But is this accessible to everyone? How? Well, there are some differences on what it covers and how it is accessible. Let me take the students example, someone with no income. If I am Portuguese, the most common situation is to be covered by my parent’s discounts and whenever needed be able to take health care for free. If I am an international student from within the European Union, the health care system and plan from my home country make my access to the Portuguese NHS easier as according to the European Union rules the right is extended. Finally, the third option is if I am an international student from outside the European Union but studying in Portugal. In this case I am covered by the NHS with free medicines and doctor appointments. To have more than those basics, a contract should be done (usually Universities help with those). Overall, the system covers quite well all the possible situations in which students can be, but does that mean it is efficient and truly beneficial? Taking my personal experience from the system, I cannot say I am unsatisfied. I am not a frequent user of the NHS but due to some breathing difficulties that sometimes appear when the season changes, I have felt already the need of benefit from it and apart from the time spent taking the treatments I cannot complain, for me it has been working quite well. Moreover, last week for instance I had a problem which cared for medical attention and two days after I was well again. To conclude my brief comment, independently from your situation, the Portuguese NHS is quite easily accessible for all and the results derived from it – taking my own experience as example, are good and truly beneficial. Have you also the same idea of easy accessibility and good treatment? What has been your experience? Categories: Economics, Health Economics, Health Insurance | Permalink. The expenditures for pharmaceutical products of health insurances in Germany increased in 2009 again about 4.8% to an amount of 32.4 billion Euro. This is much more than in other European countries. In 2010 the “Arzneiverordnungsreport” pointed out that prices of drugs in Germany are from 50% to 100% more expensive than prices in Sweden. Already in 2008 some Italian authors showed that Germany has the highest price level of seven European countries. An adoption of the Swedish price level would imply savings of 9.4 billion Euro. A reason for this is that enterprises could set prices for their pharmaceutical products freely. This is also the case in Europe only in Denmark and Malta. When a drug is licensed, the statutory health insurances have to pay the dictated price. 19 other European countries dictate the prices of drugs by observing prices in reference markets (often Germany) and setting a discount up to 30%. Other 4 countries in Europe negotiate with pharmaceutical producers. In the past several approaches of German government took occur to reduce the high costs for customers of drugs and statutory health insurances (18% of total expenditures). Most of them failed because the lobby of pharmaceutical industry threatened to reduce a fraction of their 100,000 workplaces in case of higher regulation. During a reform in health sector in 2004 the “Institute of Quality and Economic Efficiency in Health Sector” was established. This institute is assigned by a committee of government and should work as a neutral controller and evaluator of pharmaceutical products with respect to prices and utility. But this evaluation doesn’t take place at the introduction of a new product, first after three months. After six months the price of the products become fixed if there is no additional utility compared with other recent products. After 12 months the prices of drugs are negotiated between the producer and statutory health insurances, where the neutral institute acts as a conciliator. Negotiations between Ministry of Health and pharmaceutical producers in 2013 about this topic leads to selling of indulgences. The pharmaceutical industry is willing to pay 1.5 billion Euro per year by increasing the time of two years of given discounts to statutory health insurances and the price regulation of old drugs stops. Since 2010 these discounts are fixed by government by 16%. Critics of this decision mentioned that potential savings are much higher by negotiating and conforming to prices from other countries. We can observe in Germany a typical case of welfare losses in cause of price settings from producers. The efficiency of a market with respect to prices doesn’t function in this case because statutory health insurances are committed to accept the price. In case of market failure the government has to intervene and to creep over influences of lobbies to create welfare gains. Different approaches for this can be adopted by other countries by fixing prices. A more efficient way would be an increased transparency and a higher competition among suppliers of drugs. Categories: Economics, Health Economics, Pharmaceuticals | Permalink. Are pharmaceuticals becoming fast moving consumer goods? The question might seem superficial and of obvious answer. In fact, it is more than true that a lot of policies were taken by European countries to face these so-called crisis years, even substituting the imports of more expensive medicines from Switzerland and other countries, to another ones less expensive. It is consequently and predictable that the consumption of generic medicines would increase, just like the so called “white”, “retail” brands emerged in those years of crisis, which is perfectly normal, since it is a natural reaction to a less disposable income. Nevertheless, it is important to notice that private labels can be different products, while generics have to follow some requirements in order to keep the same properties as medicines. According to Infarmed, in 2012, Portuguese consumed more 5,8 million packs of medicines but spent less 190 million euros when compared with the previous year, which means that either Portuguese are buying more generics or they are paying less for the medicines, or even both (something similar happens with fast moving consumer goods, with people seeking for less expensive goods in order to consume more in quantity with the same money). Actually both things are happening. In fact, according to SNS, in the last five years patients have never saved so much, or spent so less, in medicines as this year. Although the prices of medicines started to decline before, this is also being driven essentially by the international review of the price of medicines, aligning Portuguese prices with the lowest in the rest of Europe; also it has been made an effort to incentive generics by reducing the patents of this type of medicines. As a consequence, the market share of the generics has grown (it has about ¼ of all the packs sold and 35% of the ones subsidized by SNS), a similar moving as retail brands in supermarkets for example. Until here, the similarities are pretty obvious, aren’t they? Categories: Economics, Health Economics, Pharmaceuticals | Tags: healthcare; economics of healthcare; fast moving consumer goods; generics; medicines | Permalink. User charges, to what end? European countries are well sunk in deficits and one of the main contributors is the expenses of keeping a running national healthcare system. As the financial crisis hit and countries applied a Keynesian model and increased expenses, deficits increased even further. When markets started to question some countries’ ability to repay their debt authorities cried for cuts in expenses everywhere. Portugal was one of the unfortunate ones that were simply unable to compete with the big countries in expansionist policies. Regardless of whether it was wrongdoing by the government or a chain of coincidences, in 2011 troika arrived in Lisbon to negotiate a programme of austerity that included tax raises and expense cuts in all areas, especially in healthcare, which is one of the main sources of expense for the government. One of the main policies of the government aided by troika was to raise user charges, one of the sources of financing of the NHS, to guarantee the sustainability of the system. Interestingly enough, user charges had been introduced without the purpose of financing. The argument at that time was that people were using carelessly the healthcare services of the state and that user charges would help filter the adverse selection problem that a full insurance system creates – in short they were to moderate demand. Grounded on economic reasoning, these were instituted albeit their effect was somewhat questionable. Curiously, in Germany, very recently, the argument was to remove user charges completely, a strange policy when compared to what their European brethren are doing. Back to troika’s argument that without user charges the service is financially unsustainable, it is questionable if this is the right argument, especially looking at what Germany did recently. Even if we consider that reducing the amount of service provided by reducing further the percentage of insurance is the right way to go, tax values being to hit numbers that act as a surcharge to finance the system rather than a tax to moderate demand. If €20 is supposed to moderate an emergency call, then patients might be better off in private clinics. If in fact user charges are trending towards financing the system, then we might ask if income taxes should not be enough for that purpose. Looking at the way taxes are being charged to the patients when considering complementary methods of diagnosis, makes the argument even more dubious. Since January 1st 2012, a pathologist that wishes to conduct immunohistochemical techniques to reach a diagnosis must write in the patient’s file how many he will use so that the patient can pay. Some of these techniques can cost up to €300, which translates to a user surcharge of €30. If we look at this from a financial perspective, the patient is in fact paying a percentage of what he is costing to the State. From a healthcare perspective, this is far from fair. What choice does a patient have regarding the need for additional techniques to get a diagnosis? Can the doctor make the best medical decision knowing that it is forcing the patient into a cost? There are no clear answers to the problem except one: user charges in Portugal are currently filling a role they were not designed to. It might be due to the over indebted system, or even a genuine attempt to moderate demand. Still, they are financing in in a possibly dangerous way the medical act, and condition both patient and doctor on their choices. Decreto-Lei nº113/2011: …medidas reguladoras do uso de serviços de saúde, designadamente as taxas moderadoras, as quais constituem uma das fontes de receita própria das instituições e serviços do Serviço Nacional de Saúde. (…) O Governo comprometeu-se a tomar medidas para reformar o sistema de saúde com vista a garantir a sustentabilidade do Serviço Nacional de Saúde (SNS) (…), quer no que diz respeito aos seus recursos financeiros. Entre essas medidas encontra-se a revisão do regime de taxas moderadoras do SNS. Decreto-Lei nº113/2011 Artigo 2º alínea b): Na realização de exames complementares de diagnóstico e terapêutica em serviços de saúde públicos ou privados. Categories: Economics, Health Economics, User Charges | Permalink. The healthcare debate in the United States is an old one that extends for more than a century. The greatest changes came in the Johnson administration when Medicare and Medicaid were instituted, respectively, insurance for seniors paid for by a federal employment tax and a program of insurance for the poor managed together by the federal government and the individual states. In 2009, according to World Bank statistics , the U.S. had the highest healthcare costs relative to the size of the economy in the world, despite an estimated 15.6% of its population lacking insurance. Given this scenario a healthcare reform was badly needed. The law is quite complex, as are the problems it intends to tackle, but it can be summed up as way to expand the insurance market to those that don’t have access to it and a way to control healthcare costs. It expands coverage by requiring insurance companies to cover people they would otherwise reject (such as those with preexisting conditions) and requiring them to offer similar premiums to similar individuals based on a community rating. Individuals will acquire their insurance through health insurance exchanges and there is an individual mandate that requires individuals to buy health insurance or pay a fine. This individual mandate is the source of much of the controversy surrounding the law, however it is absolutely necessary otherwise there would be a risk of premiums going through the roof due to adverse selection, that is, only risky and sick applicants would enroll since they cannot be rejected and healthy individuals would not enter the market since they would feel no need to buy health insurance. In addition to this changes the law expands Medicaid coverage and includes subsides to those with income below a certain threshold in order for them to be able to afford health insurance in the new exchange system. To pay for this changes, as well as to reduce healthcare costs, some new taxes will be levied, for instance, a tax on so-called “Cadillac health plans” which consists on plans that have a large coverage with small or no co-payment by the patient and which lead to an over demand for healthcare. Regulation of the insurance industry has also been tightened, for instance, insurance policies need to have a minimum quality standard and companies will have to spend 80% to 85% of their premium collection on healthcare expenditure. Taken as a whole this reform will increase insurance coverage in the population and, according to estimates by the Congressional Budget Office, will increase the sustainability of government’s expenditure in the health sector. The connection between economic crisis and health may sometimes be ambiguous. People drink less because they save on alcohol or they drink more because there are more unemployed? Life expectancy increases because of saving in car expenses, but people eat worse because junk food is cheaper… but there are some outcomes that are not confused at all, and here there is an example. 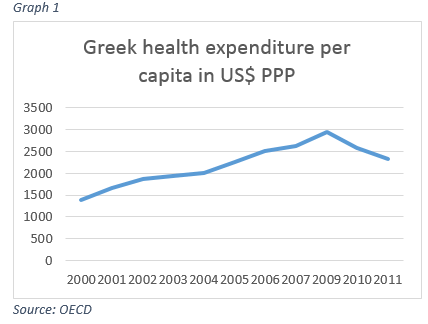 Greece was particularly hit by the crisis: since 2008 austerity measures have been being implemented and Health Ministry has not been spared (Graph 1). There was a drastic reduction in financing of anti-drug policies: for instance one of the main actor in Athens- National Organization Against Drugs (OKANA) – passed from a budget of 40 million in 2011 to 18 in 2012. Two negative consequences of the crisis reciprocally enforced. Drug users increased due to the worsening of socio-economic conditions and free distribution of syringes and condoms was cut enhancing the outbreak of HIV among injecting drugs users (IDUs). In 2012, in Greece IDUs infected by HIV have been estimated as 487, with a 35-fold increase in two years. European Monitoring Centre for Drugs and Drugs Addiction (EMCDDA) recognizes the strong correlation between the crisis and the outbreak of new infections. Consumer increased consume of “sisa” a synthetic mainly injected drug approximately 10 times cheaper than other drugs such as smack crack and meth. The link between prostitution and drug addiction, according to the agency, strengthened: it has been estimated that more drug-addicted decide to prostitute in order to pay for a dose. Now Greek Government reacted with a new campaign against the HIV epidemics: reduction of waiting lists for substitution treatments, new street work programmes, increase in syringe and condoms distribution and number of HIV tests since 2010. The overall consequences of the temporary reduction of these costs for preventions have been disastrous: two years of apparent savings in health services related to drug-addicted protection, will determine a much higher cost for the system in the next future (lifetime expense for the treatment is estimated as $379,668, being among the most expensive existing treatments). This will be an awful heritance of this European debt crisis. See Galea S. et al. “Social determinants and the health of drug users: socioeconomic status, homelessness, and incarceration”. Public Health Rep. 2002; 117(Suppl 1): S135–S145. See Schackman BR, Gebo KA, Walensky RP, et al. The lifetime cost of current human immuno-deficiency virus care in the United States. Medical Care 2006; 44: 990-997. Categories: Economics, Health Economics | Permalink. In the past years, the temperature of the earth’s surface has risen by 0.8% and is likely to exceed 1.5°C relative to 1850 to 1900 till the end of 21st century (IPCC, 2013). This has caused elevated average temperatures, differences to rainfall patterns, rising sea levels, and increased intensity of extreme weather events; and will continue in the future. Not only has it taken its toll on our environment itself but also on human health. Climate changes have both direct and indirect effects on human health. Direct effects include increased mortality rates, e.g. through long-term droughts, and cardiovascular impacts; indirect effects include malnutrition, increased risk of infectious diseases, like Malaria, increase in Asthma, just to name a few (Dobler & Jendritsky, 1998). These negative effects on human health will also impact a person’s demand for health care. As is given by the Grossman model, an individuals’ utility is conditional on certain health levels. The utility he receives from health determines his demand for health and ultimately health care. If, for instance, malaria struck in Europe, a person’s overall utility will decrease given a decrease in levels of health. To improve his utility from health he may spend time and money in health improving activities, like health care, namely treating malaria through adequate medication. In other words, climate change will negatively impact a person’s health, increasing his demand for higher levels of health, and thus health care. Yet are current health care providers ready for this increase in demand? Probably not. To illustrate, a heat wave in California in 2006 cost 655 lives, 1620 hospitalizations, more then 16 000 excess emergency room visits which resulted in US$ 5.4 billion costs (NRDC, 2011) – an unexpected increase in demand for Californian hospitals which they may have not been prepared for, increasing their costs in resources and perhaps lives lost. Health care providers need to be more proactive than reactive in the fight against global warming to decrease an unexpected surge in health care demand and to mitigate its cost. First, they need to be prepared. Reliable power sources and enough supplies, for e.g. an outbreak in any disease related to a climate change effect, will make them more resilient and self-sustained when disaster strikes (Cohen & Thompson, 2013). Secondly, they need to be advocates of the impact of global warming. Often implications of global warming on the environment are made, yet only few with respect to human health. If people knew the implications of climate change on their health, they would start acting differently. Also, healthcare professionals, like doctors, are trusted and credible in many communities; they are very likely to be listened to. Hospitals could create initiatives to increase awareness of these effects on human health. Finally, health care providers themselves need to be “change” agents. Currently, in Brazil, hospitals account for 10.6% of the country’s total commercial energy consumption. Also, in the US, the health sector’s conventional energy use contributes to an over US$ 600 million increase in health costs, like increases in asthma and respiratory illnesses (WHO & HCWH, 2009). By becoming more efficient in the use of water, electricity, food, and other resources, they are able to significantly reduce their carbon footprint. By implementing the proposed measures health care providers will be able to meet the demand for health care due to the adverse effects of global warming, improving people’s health and increasing their utility. Adding to this, the providers positively impact human health by non-conventional health care measures, i.e. as advocates of pro-green movements and by reducing their carbon footprint. These measures help to mitigate the impact of global warming on the environment, diminishing the adverse effects of the environment , positively impacting human health. One third of the industrialized countries restricts his health expenditures due to difficult budget situation clearly, but with consequences which are difficult to forecast. On the other side, questionable treatments are booming: More and more cesareans, more and more anti-depressants, more and more artificial hip joints. An OECD report reveals a contradictory picture of modern medicine. During the crisis, the industrialized countries save more money on the health of their citizens. The Organization for Economic Cooperation and Development (OECD) complained that eleven of its 34 member states have reduced their health spending between 2009 and 2011. Within the organizations current report “Health at a Glance 2013” its stated, for example, that in Greece, these expenses decreased by more than eleven percent, in Ireland by nearly seven per cent. The governments of these countries have medical facilities closed, reduced salaries of doctors and nurses and saddled their citizens with higher co-payments. These are certainly loads for all concerned in this situation. But are these negative changes actually reflected in the health of the population ? The OECD report discloses mixed results. Thus the suicide rate in Greece rose since the crisis began, but meanwhile it stagnates. The authors of the report see evidence that the infant mortality rate in Greece also increases. Other consequences seem positive – at least at first glance . Since the crisis began, fewer people die in traffic accidents, simply because fewer are traveling in the car. It is pleasing to the health strategists that in many crisis countries the alcohol and tobacco use has declined. This is due to the simple fact that people have less money available. But according to the OECD experts this is also an after-effect of previous prevention programs. Therefore the positive development is already in danger again. Because the costs of health care are significantly decreased in more than three-quarters of OECD countries. The governments which decrease expenditures on the prevention of obesity, alcohol abuse or nicotine dependence, can only achieve short-term effects. Consequently the health care costs will rise in the long term because of exploding unhealthy behavior, the authors warn . An immediate consequence of limited preventive measures can be observed in Athens, where the HIV infection rate among drug users has grown rapidly since the crisis. There is another message in the report: While money is saved on the one hand, there is on the other side too many questionable treatments. Thus, the rate of caesarean sections has increased from 20 to 27 percent of all births in the OECD countries in the time period of 2000-2011. The differences are enormous: while in Iceland It counts only for 15 percent of the births, in Mexico almost every second child is born with caesarean operation. Categories: Economics, Health Economics | Tags: Economics of health and health care | Permalink. In this post, I suggest some ways of making health insurance more affordable and accessible with less, rather than more, government interference in the market. It has become commonplace to use the case of the United States as evidence that leaving health care to the workings of the free market results in worse outcomes than if it provided by governments, as is usually the case in Europe. Unfortunately, the health insurance market in the US can hardly be described as free, even before Obamacare. It has long become little more than a playground for politicians to push their pet social goals. One of the reasons why health insurance tends to be so expensive is that government regulation forces insurers to include some benefits in their plans that buyers don’t want, don’t need, and are not even insurance against any discernible risk in the first place. A case in point is that, under Obamacare, everyone must buy health insurance that includes maternity care benefits. Even men. These mandated benefits are not new to Obamacare, but they differ widely among states. Instead of mandating additional benefits, the federal government should allow people to buy insurance from outside their state. This would those living in states where politicians see themselves as social engineers to “escape the asylum” and get affordable health insurance that only covers actual risks to themselves, and not socialized care to others. Another way of making insurance more accessible would be to shift away from employer-provided health plans to individually purchased insurance. Why exactly anyone thought that employer-provided insurance was a good idea in the first place beats me, but the problems are obvious: when you lose your job, you lose your health insurance. Even if you don’t lose your job, you will not want to change jobs if you already have a serious health condition, because it may not be covered by the new health plan. Unsurprisingly, this problem was also created by the government. Employer-provided health benefits are excluded from taxation, which means that if you want health insurance, it is cheaper to ask your company to provide it (in exchange for a lower salary) than it is to buy it yourself. In fact, this is the biggest tax deduction in the US. Not only does it present an enormous cost to the treasury, it also creates huge distortions in the health insurance and labor market. Since it is such a bad policy, it should come as no surprise that not only will it be maintained by Obamacare, it is being expanded! From 2015, companies with more than 50 employees will be forced to buy insurance for them. Instead of fixing what was broken with health insurance in the US, Obamacare has managed to take every bad policy in the book and make it worse. Categories: Access to health care, Economics, Health Economics, Health Insurance | Tags: health insurance, obamacare | Permalink. A major provision of the U.S. Affordable Care Act is scheduled to come into force in January 2014: from this date, health insurers will no longer be permitted to discriminate on the basis of health status. This means that individuals with pre-existing conditions cannot be denied coverage, the pre-existing condition itself must be covered and the insurer cannot charge a higher premium because of it. The whole idea of insurance is based on the transfer of risk. A healthy person signs up for health insurance because he or she faces the risk of developing a condition requiring expensive medical treatment. But what risk is being transferred when a cancer patient signs up for insurance? That he will require expensive treatment is by then a certainty, and the prohibition on charging higher premiums ensures that he will always in effect be receiving subsidized care. This provision, by itself, would create a system in which no one would get insurance until they developed a serious problem. So the government, ever so eager to “solve” problems (of its own creation), decided to require everyone to purchase health insurance (the individual mandate provision). Remarkably, while the individual mandate is by far the most unpopular provision in the ACA, the provision that guarantees coverage to people with pre-existing conditions is one of the most popular: even Republican legislators have steered clear of criticizing it. In any case, the penalty for not holding insurance is so low that many young, healthy adults may prefer paying it to purchasing insurance they don’t need anyway. The end result is a classic case of adverse selection, where only sick old people buy insurance. Obamacare is socialized medicine through the back door: by introducing even more senseless regulation in the already over-regulated health insurance market, it puts the whole system on a near-certain road to complete failure. But fear not: when that finally happens, the government will be there, as always, to solve the problem. Categories: Health Economics, Health Insurance | Tags: health care, health insurance, individual mandate, obamacare | Permalink. Aren’t we underestimating palliative care? It is true that the developments of health care, treatments, drugs and even cures have been increasing considerably with time, but that does not apply to every disease. Unfortunately there are still some chronicle diseases that urgently need a cure, but that specialists and technologies were not able to discover yet. For example, in Portugal, cancer already kills 24 thousand people, and according to World Health Organization, this number is about to increase by 34% until 2030, while in worldwide terms the number will reach the 13 million people. Going a little bit deeper, in Portugal the number of cancer cases below 65 years old will most likely increase by 12% hence in older people the growth is about to reach the 40% mark. The truth is that we live in an ageing population. In Portugal people over 65 represent almost 25% of the total population and this number is expected to increase to near 35% in 2050. In addition, the ageing index has been growing exponentially, to near 127%, which means that people over 65 are more than double of the ones until 14 years, and that should be a reason to be worried. To be worried first all because, as the Grossman Model predicts, the more older we are more healthcare we demand, and continuing at this pace, in a near future we will most likely not have enough active people to satisfy that demand. Nevertheless, if we join all the dots we get to the point I want to highlight. The number of chronicle diseases it is increasing, and science hasn’t found a solution for that yet. At the same time, population is getting older, which obviously accelerates the growth of the number of these diseases. So the question that we should rise is: if science cannot do anything for these patients, what can we do that is going to increase their utility, their well being, that at least gives them dignity and release them from pain in the phase that they are heading to death? It is curious to know that according to INE 51,2% of people would prefer to die at home, but incredibly, 61,7% of the Portuguese actually end up dying at a hospital. At the end of the day, only 10 to 12% of the Portuguese have access to Palliative care, when about 60% need it. Palliative Care are, according to World Health Organization, “Palliative care is an approach that improves the quality of life of patients and their families facing the problem associated with life-threatening illness, through the prevention and relief of suffering by means of early identification and impeccable assessment and treatment of pain and other problems, physical, psychosocial and spiritual”. Again, in Portugal there is only 1 to 1,5 domestic support services of palliative cares for 100.000 habitants and 80 to 100 beds per million of habitants (http://www.observaport.org/sites/observaport.org/files/RelatorioPrimavera2013.pdf), which is incredibly low compared to the demand that we are facing. In a time that population is changing and the healthcare necessities are changing if it, shouldn’t we be changing gears and shifting to solutions that can actually increase the utility, meaning will being, of these people? If that was not enough, one of the reasons why people do not have access to palliative care is because most of them do not have access to private health insurance, benefiting only from the public insurance offered by SNS which does not offer this type of care, which ends up being even more surprising considering the fact that palliative care is not as expensive as people in general think, especially when compared with the recurring attempts for saving people that unfortunately cannot be saved, through chemotherapy and other procedures. The question remains: aren’t we underestimating the palliative care? Categories: Access to health care, Demand for health care, Economics, Health Economics, Health expenditures, Health Insurance, Public Health Care | Permalink. In life, there are some people that we need to trust. Our doctor is one of them. However, how do we know that our doctor has the same interests as us? After all, treating sick people is this medical practitioner’s job, and not something he or she does on a volunteer basis. One can argue that most doctors probably do their absolute best in saving as many lives as possible. I would like to believe in this argument. Still, I doubt that it would hurt with a system of incentives that gives the doctor and the patient the same interests. Agency relationships occur when two or more parties have different and/or asymmetric information. Normally, this would make the person with the best information the decision maker. In other words, your doctor should make all the decisions concerning your health. But as mentioned above, my interest may not coincide with my doctor’s interests. Personally, I would like to get the best possible treatment for the lowest possible price. This is where the system of incentives may help. In Norway we have something called “The arrangement of a regular GP”, where GP stands for General Practitioner. The purpose of this system is to allow everybody to sign up for a GP, and thereby improve the quality of general medical practice. So the purpose is good. The doctor’s gets a number of regular patients on its list and you get a regular doctor. Maybe by getting a personal relationship with your GP, the interest will be more alike? In theory you are also allowed to choose your GP. At the same time, for every person on a doctor’s list, the doctor is granted a relatively large sum of money from the government. Hopefully this money will give the GP an incentive to give the best possible health care and to protect the interests of the patient, since the most popular doctors get more patients on their lists and thereby more money from the government. Is it like this in real life? I don’t know. It can be very time consuming to change a regular GP when you want to, so I think many people just stick to their doctor almost no matter what. And if you want to switch, which doctor should you choose? The ones with many patients on their list? They are popular, yes, but do they have proper time for so many patients? Either way, as I mentioned before, the purpose of the arrangement is good. I doubt that it works perfect – not all doctors share the interests of their patients, but at least it’s a start towards a good system of incentives. Categories: Agency relationship, Economics, General Practitioner, Health Economics | Permalink. It is a fact that clinical practices may vary considerably between different areas within a country. Doctors seem to differ in their decisions about health care treatments and medicines, independent of the patients’ characteristics. Moritz et al. (1997) have done an experiment on breast cancer in England and the connection between the mastectomy rate and cancer cases per doctor. They found evidence on variations in the number of patients who receive a mastectomy, even though the size of the tumors was similar. In the course “Economics of health and health care” it is suggested that these variations can be explained with uncertainty about technology and differences in demand and cost conditions across regions. Technology uncertainty will lead to dispersion in practices, but this explanation is not fully satisfactory. The same applies to differences in demand and cost conditions. If people are similar across regions, one should think that their treatments would be similar too. Another example of variations in effective care, and also patient safety, is the underuse of beta blockers at time of discharge from hospital after a heart attack. The Dartmouth atlas documents show variation among 37 hospital referral regions containing one or more of the academic medical centres identified as the 50 best US hospitals for the treatment of cardiovascular disease by US News and World Report. In the region with the best record only 83% of ideal candidates received a beta blocker; in the region with the lowest record less than 40% did. This variation is a risk for patient safety, when in some areas the patients are not receiving the needed medical treatment to cope with their illnesses. In an article by Martin Sipkoff (2003), nine things that health plans and provider organizations should do to reduce unwarranted practice variations are formulated. For example, high-risk patients must be identified by collecting data which identifies those who have the potential for using the most resources. Also, physicians should be given incentives to follow treatment guidelines etc. In Norway, doctors are given an incentive to give their patients the best care possible through the primary doctor system. They receive a higher wage if they have a full patient list, and a full patient list only comes with a good reputation. Furthermore, we need continuous quality improvement, implementation of disease management programs, investment in information technology and an increased patient involvement in their own health. There is a problem when you find that the approach in one city is to operate, and in another city it’s watchful waiting. In many regions, physicians are not using evidence-based medicine to guide their care. The practices are not up to date with the medical knowledge, causing much confusion and variations in a wide range of treatments. Patients are getting worse, or even dying, because of this. This time I really wanted to write something positive about the polish health care system, however, after some hours of looking for a proper topic I came across very interesting information and then I changed my mind. On January 1st 2012 a very controversial Medical Refund Act came into effect in Poland, arousing loads of discussions and objections not only from consumers but also from pharmacies, medicine producers, doctors and hospitals. Actually it was the most complex and bringing most changes act on the polish drug market since 20 years. The idea of the Act is to make changes in conditions of refunded medicines, food intended for special purposes and medical devices. According to the common assumption it should have increased the availability of medicines for patents through decreasing the drugs’ prices and patients’ co-financing level, however, it also excluded over 800 preparations from the list of refunded medicines. How does the situation look like after 9 months? The first reaction was a mass purchase of refunded medicines in the end of 2011 by polish people. It led to loads of funny situations and paradoxes. For example my grandmother, who has been a diabetic since many years, bought some packages of medicines for hypertension and neurosis, although she does not need it at all. When I asked her about that, she answered, that you never know what can happen and it is always better to be prepared. Her colleagues did the same and millions of other polish people as well. They contributed to the fact that in December 2011 the sales of refunded medicines was about 35% higher than in comparable period of 2010. The biggest loser of Medical Refund Act implementation are the pharmacies. The end of 2011 was extremely profitable but then everything collapsed. While the gross revenue from the sales of medicines amounted to 13.2 trillion PLN in 2011, rising at the rate of 5.6% comparing to 2008, the forecast for the end of 2012 accounts for 11.6 trillion PLN, which means a decrease of 11,3%. What comes to the issue of patients’ co-financing level of refunded drugs, instead of decreasing it is still increasing and according to the forecasts it will amount to 37,8% whereas in the same period of 2010 it stood by 35,1%. It is a result of the fact, that the patients still must buy some medicines, although they are not refunded anymore. It means a negative change for consumers by 2,7 percentage points, which is in my opinion a big failure of this “great idea”. To sum up, so far the new Medical Refund Act neither dropped the drug’s prices nor the co-financing level of patients. Evidently polish legislator did not like the fact that an average expenditures on drugs per capita in Poland is about two times lower than in the whole Europe (for Poland: 114 EUR, for Europe: 218 EUR) and decided to “improve” the statistics by removing refunded medicines from the list. In the end the only institution, which benefits from the Act implementation is so far Polish Government because of less expenditures. Let’s see what future brings. Categories: Health Economics, Pharmaceuticals | Permalink.